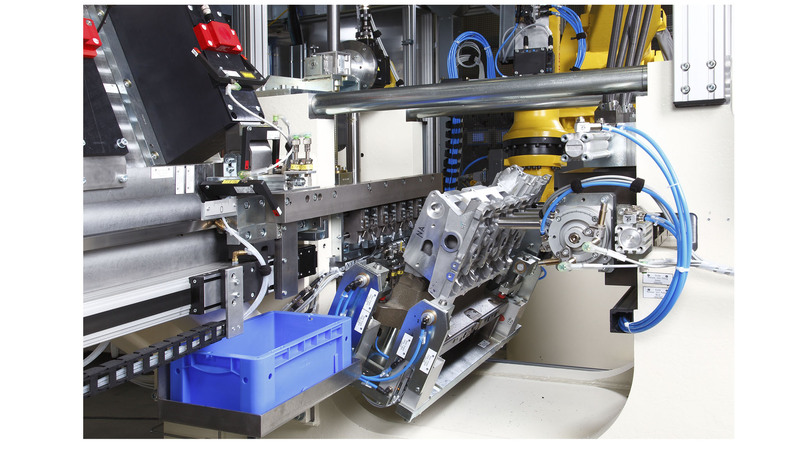 Alfing Montagetechnik GmbH produces assembly systems for the semi-automatic and fully automatic preassembly of heavy vehicle assemblies, such as cylinder heads and crankcases in supervised and documented quality. Solutions are implemented as manual assembly workplaces up to concatenated stations. A flexible mounting module for the assembly of valve seat rings and valve guides in cylinder heads can be quickly retrofitted for product changes with four NC axes and one tool magazine for up to 12 press-in tools. It offers functions such as: feeding, testing for partial adequacy, subcooling of the rings in the nitrogen bath, oiling, as well as force-travel-monitored pressing. Other typical processes are the production of screwed connections, the screwing-in of stud bolts, the warming of the crankcase for inserting bushings, the application of sealants, leak tests as well as presence and assembly tests. Depending on the task, cycle times of 16 s up to several minutes are reached. The systems are built on welded racks. If high numbers of parts are required, the concatenation is possible via a workpiece carrier transfer system. The process stations comprise all the necessary feed, concatenation and handling devices, including robots. The assembly systems are supplied ready for use. The systems are built on welded racks and are realized in the desired degree of automation from the manual assembly workstation to the automatic longitudinal transfer assembly line. As far as possible, the systems are based on proven components. Fields of application are, for example, the assembly of bearing covers for crankshafts and camshafts, stud bolts and locking parts, as well as the fitting of cylinder bearing bushings in cylinder bores. The equipment includes all the necessary process stations, feeders, linkages and manipulations, for which robots are also used, as well as the control system. User industries are the automotive supply and automotive industries.